Dolphin Boats | Holiday exactly the way you want it! Dolphin Boats – Holiday exactly the way you want it! Private Cruises. Holiday exactly the way you want it! The islands presents itself with mild temperatures, sunshine and blue skies. Just in time for the start of the season, Dolphin Boats presents a completely new yachting concept deluxe – Dolphin Boats Private Yachting. Anyone who has visited the Balearic Islands or the Med during summer has certainly dreamed of escaping mainstream tourism to enjoy the infinite tranquility on the sea. We at Dolphin Boats make your dream come tru to spend your holiday on the sea living like in a chic hotel with all its amenities, and at the same experiencing the Spanish lifestyle and attractions – a holiday for all senses. With a fleet of luxuriously equipped catamarans over 40 feet long and motor yachts from 43 feet up, Dolphin Boats offers its guests, exclusive and stylish floating accommodation in the Balearic Islands and the Med. From a day trip to a one-week private cruise, everyone can get to know the islands in their own personal way. Let’s start from Mallorca, to circumnavigate the largest of the Balearic Islands and get to know it from the sea site is indescribable. Or you can head for the ‘little sister’ Menorca or the hip Ibiza and Formentera with its white sandy beaches and the crystal clear, turquoise waters. This luxurious cruise experience by the way is not limited to the Balearic Islands, if you wish to spend your holiday in Croatia, Greece or Italy; Dolphin Boats takes its guests to dream locations to enjoy the perfect vacation. The professionally trained captain takes care of the smooth running of the cruise, but the guests are also welcome to take command of the steering wheel. Often the guests want to prove their culinary skills and enjoy the experience to cook on a yacht, put on the chef’s head – seafood, paella and other Mediterranean dishes are awaiting to be prepared your personal way. Dolphin Boats is not just about sailing. The professional, international team ensures that the Private Yachting experience is truly tailored to the wishes and preferences of our guests. Away from the hustle and bustle of daily life, let your soul wander, with a glass of red wine in your hand and enjoy the view of beautiful beaches – that is authentic cruise feeling deluxe. The guest can stay anywhere as long as he pleases. Relaxation is always at the forefront of a perfect vacation. If the guest prefer their trip a bit more active, it is no problem to take a break from the tranquility on board the luxury yacht for a few hours and in exchange for a pinch of thrills. Mountain biking through untouched nature along the coast, high up in the air with a hot air balloon over Ibiza or canyoning in Mallorca? Everything is possible – and at every moment. As an exclusive member of the Dolphin Boats Private Concierge Club, guests can relax before the holiday begins. The entire organization of the private cruise is taken care of, the guest benefits during the trip from the advantages of the exclusive partner program and receive, among other things, a membership card in the form of a Dolphin Boats credit card, which is accepted everywhere and the guest can benefit from special conditions at selected restaurant or tour operators. Whether it’s a horseback riding trip on the beach, a Segway tour in Palma, a day out in the trendy Beach Club or booking a table at a popular restaurant in Formentera or a night club in Ibiza – the Dolphin Boats Private Concierge Member Card will open doors for you. Also, as a member you get an exclusive digital guide with all the insider tips and all contact details so you have direct access to all contact details of the partners for reservations and bookings. Especially great for families! In times when families and friends are scattered around the world, spending time together is more precious than ever. Do you remember the annual family vacation where the car was loaded to the brim, the children and grandma in the middle, the dog and the cooler on the back seat …? No cell phones, no tablets, just a lot of fresh air, lots of fun, laughing together and relaxing together – a suitcase full of memories. Host a family reunion or celebrate a special occasion together in an amazing atmosphere! Grandparents with children and grandchildren, patchwork families, single parents with grandma and grandpa. The grandparents enjoy the time with the grandchildren, the parents can sleep in and the children are pleased to be pampered by grandma and grandfather. Browse the exklusive offers oft he Private Concierge Club and experience private yachting. Discover beach clubs that care for the little ones, take an e-bike tour with grandma and grandfather along the coast, turn the night into day in one of the trendy clubs and enjoy the sunset by the sea. .. A wide range of possibilities for a tailor-made adventure for the whole family is waiting for your. 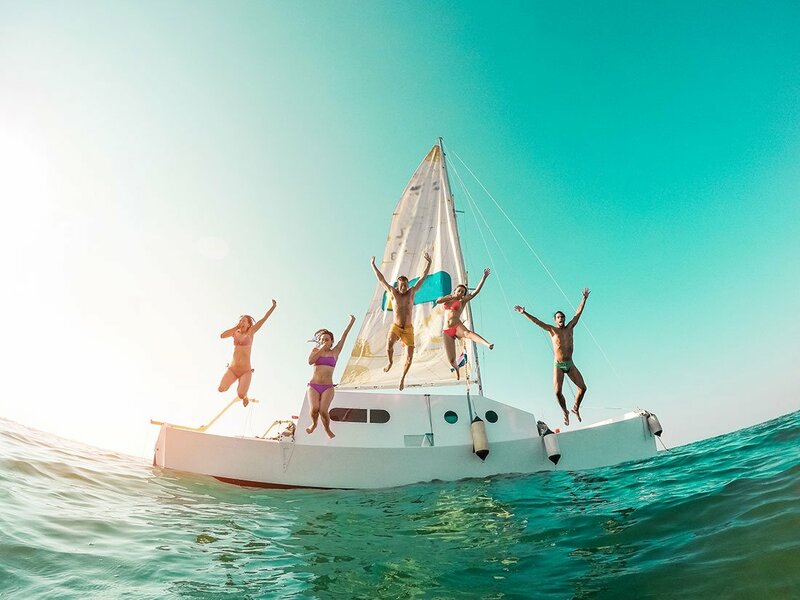 The Dolphin Boats travel experts ensure that all ages are addressed and that the right balance is made between shared activities, culture and relaxation, small adventures and explorations, so that all family members can enjoy the precious holiday time together. Whether it’s going to be a romantic or an active vacation, a corporate event, a family vacation, or just a day trip – Dolphin Boats offers its guests comfort, luxury, first-class service, and all the comforts of luxury accommodation. So, do not wait too long with the reservation, the season is upon us, do not miss out on this sailing dream with Dolphin Boats!